Sage Handbooks have a deserved reputation as quality scholarly reference texts. This addition to the series has followed the first rule of quality control in such matters, namely that the publishers find a strong editorial team whose members will be able to recruit from a range of contributors covering the main aspects of the subject of the text. The second rule is to permit editorial freedom for the editors to act as gatekeepers to ensure quality control. With some reservations which are indicated below, I found the result meets most of my expectations in these respects. Collectively the contributors provide thoughtful and scholarly treatmentsof their chosen themes within five sub-sections: Macro perspectives (strategic leadership, charismatic leadership, complexity leadership, and networks); Political and philosophical perspectives (distributed leadership, critical leadership, ethics, and cults); Psychological perspectives (personality, style, transformational leadership, exchange relationships, cognition, leadership development, gender, trust, identity and the ‘dark side’ of leadership: Cultural perspectives (spirituality, aesthetics, and creativity);and Emergent themes, (followership, virtual leadership, emotions, image, celebrity, and the quest for a general theory of leadership). Individual chapters cover an impressive range of topics which provide informed and up-to-date accounts for the leadership researcher. It might be argued that the topics are largely those found in popular graduate-level textbooks such as the ones by Yukl (a contributor), Daft, and Rickards (2nd edition). There is an absence of an integrative chapter offering an overview of connections within and across the five themes identified. The editorial decision in this respect was to provide one paragraph summaries of each of the book’s 38 chapters as a first chapter. Researchers and students would probably have appreciated a final chapter which at least indicated editorial consensus and disputed regions. 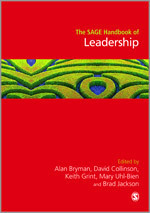 The book is a key reference point for researchers and students of leadership at the present time. It has rapidly become one of my the texts I turn to first in assessing new leadership ideas appearing in the scholarly literature. The book has made considerable progress in identifying the work emerging from a group of researchers publishing primarily in three leading journals in the field. I would have liked there to have been some mention of more applied work, for example provided by those working at the interface of academic work and communication of ideas to practitioners (Gladwell comes to mind), and leadership scholars such as David Yamada who have preferred the electronic route to communicate their ideas. Perhaps a future edition would find a way to make links with such a community of practice. You are currently browsing the Leaders We Deserve blog archives for the day Thursday, January 12th, 2012.